Well, Easter will soon be upon us and what could be more delightful than to receive a cheeky chocolate otter showing off with the fish he’s just caught? I fell in love with him as soon as I saw him on Bettys website. He reminds me of the film Ring of Bright Water which I shed so many tears over as a child; I expect I would again if only I could bring myself to watch it. An enormous box duly arrived in the post – my otter! He came so well wrapped, it was like pass the parcel. As I peeled back each layer, I kept thinking I had arrived, only to find another one and then another. But it was just as well, it would have been very sad to have spoiled the beauty of this gorgeous beast. A handful of broken chocolate shards in a bag just wouldn’t have cut the mustard. I so didn’t want to break this lovely creature up and seriously contemplated keeping him for ornamental purposes. But this was a review and I did need to try the chocolate. Now this otter weighs in at a grand 430g so I wasn’t sure quite how thick the chocolate was and how I was going to break into him. After ceasing the rolling pin and putting it down again a few times, I hardened my heart and gave him a bash on the back – oh dear! He wasn’t hard to break. The top half of the otter was thin skinned and he sat on a very thick and solid bottom. Once broken into, I pulled myself together and grabbed a bit of otter. I’m always rather tentative with milk chocolate, because although it’s my favourite, I appreciate a high cocoa content and don’t like it too sweet. As with the other Bettys products I’ve tried, I was not disappointed. Do have a look at Bettys Dark Chocolate Selection and Bettys Christmas Gugelhupf. The chocolate tasted of chocolate and melted smoothly on the tongue releasing noticeable caramel tones – it was delicious. An otter isn’t just for Easter you know. Although he’s perfect to eat at any time of year, I feel he has a certain spring like quality. I’m assuming, of course, he is a he – I didn’t check that carefully. Made by hand from Swiss chocolate with 38% cocoa solids, this beats your average Easter egg hands down. At £20, he isn’t cheap, but quality will out. If you don’t fancy an otter Bettys has plenty of other Easter and spring time treats available via their online shop. Thanks to Bettys for the chocolate otter. There was no requirement to write a positive review and as always all opinions are my own. 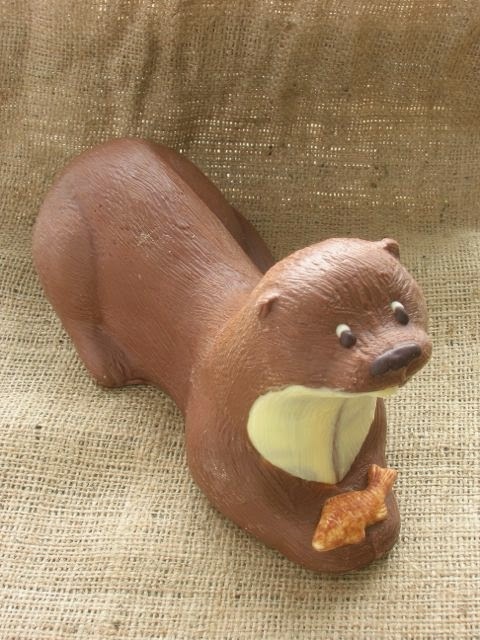 Bettys have kindly agreed to give one of my readers a milk chocolate otter too. To be in with a chance of winning, please fill in the Gleam widget below. You will need to leave a comment on this post which then gives you additional chances to enter if you so wish. Gleam will pick a winner at random from the entries received. If you are commenting anonymously, please give me some way of identifying you as I will be verifying the validity of entries. Any automated entries will be disqualified. This giveaway is only open to those with a UK postal address. Winners will need to respond within 7 days of being contacted. Failure to do this may result in another winner being picked. Betty’s Chocolate Otter sound like some kind of Carry On-esque naughty word… or is that just me? Ha ha, so it’s not just Dom after all. Otter sound good to me, just think it needs an L in front to make it a Lotter of Chocolate. ~I saw these in Bettys York a couple of weeks ago and fell in love! A Highland Cow…random but it was the first thing I though of! Shetland Pony – or perhaps a Dales would be more appropriate (+ bigger). The otter is so cute, almost too nice to eat. Thanks Debby 🙂 I honestly had real problems breaking the otter up – he was gorgeous – all that’s left now is a big slab of chocolate base. A lion! Congrats on having another giveaway, your blog must be doing well! Thanks Janine. I used to do two giveaways a month, I now only do one! My kiddoes would love this. Actually, I would love this. OMG otters are so cuuuuuute I want one as a pet!! Ahh I love that film! So sad though, I have no emotion with films about people but show me a cute animal and I’m in pieces! I love ring of bright water too. Bizarrely when I was last in Tuscany, the villa had a DVD player and a very limited selection of English DVDs – including ring of bright water. What a lovely chocolatey one! Chocolate is always such a star at this time of year! An unusual choice for Easter, but it is really cute! For some absentminded reason, I put my name in the Gleam widget as Bev – it won’t let me change it. 🙁 Sorry! A blue whale….lots of chocolate! A grizzly bear – big and dark, just how I like my chocolate! A Meerkat, only because a toy one is staring at me at this moment in time! A meerkat as work is obsessed with them! an elephant – a nice big elephant……………..
Wouldn’t a chocolate otter … melt? Elephant – the bigger the better! A blue whale – would have to contain plenty of chocolate! An Elephant, That’s a lot of Chocolate ! A lifesize chocolate elephant, it would only last me a week. mmm yummy! and oh so cute! I would love a chocolate version of my cat! a meerkat, because i love them! A chocolate otter is really quite mad! A pig filled with truffles would be good though . . . I would choose an elephant. what a gorgeous Otter though!!!! so cute!! A Blue Whale – Chocolate for life!! A hippopotamus – think of how much chocolate there’d be! A hippopotamus – think of how much chocolate there’d be mmm! A blue whale – the largest mammal in the world – therefore more chocolate. I’m sure I’d feel like a whale after eating it too! I’d love a chocolate sloth! A duck – Easter themed! A giraffe – so I could chomp my way down the neck! Humm i think a kitten would look cute! A giant whale – more chocolate to eat! My cat with her weird chin! 🙂 hehe! A blue whale – what a lot of chocolate!! a large animal, so an elephant. big animals = more chocolate! A hedgehog, it could have twiglet spines. A Giraffe – nice long chocolatey neck ! A blue whale should quell the better half’s cravings for a day or two. A Big Brown Bear, but I love the Otter too ! The biggest animal i can find as i love Betty’s chocolate so maybe a dinosaur!! A dog because they are my fav. It would have to be something huge like a blue whale, lifesize of course! Without doubt….. a disgusting looking cockroach……. keep my other half grubby mitts off it and more for me! Bwwwah hahahahaha! An elephant – life size! a hedgehog would be fun! An Elephant so there would be lots of choccy! A Panda!! My favourite animal and would be a perfect combination of dark and milk chocolate – yum yum! !